I'm giving some friends a ride and suddenly I hear the sound of metal rolling down the road, I stop and look the car over and the front hub cap is missing. I know things can loosen up but I just had them off last week and I know I tightened them up real good. I don't like to point fingers but last week my wife and I had a big get together at are house and I parked the T and the 40 Chevy truck in the front yard near the road just for yard art and so the folks would know what the right house was. I wonder if maybe someone wanted a memento of there visit. It does take a lot of turns to remove a cap, maybe between the grease and the time it took to get the cap off maybe they just only had time to loosen it a few threads. I never did find that hub cap. Unless it's cracked, I think the chance that a hubcap that's all the way on could work loose is extremely unlikely. It wouldn't surprise me at all if you were right about it having some help. Months later I was in the body shop down the street and there it was on the desk as an ash tray. The owner had found it while on a walk. It took some talking to convince him it was mine. I offered a finders fee but he decline. I have given he and his grandkids some rides since. Strange thing happen. Had my 05 chev 2500 in the shop this morning. When I left the gas station I heard a noise from rear wheel. Thought maybe a loose cap on rear wheel. The center caps with plastic nut that screws on to lug nut. Sure enough I tightend them by hand and took off. Same noise as before. Went right to shop that I use and had put new tires on in April thinking U joint or bearing. 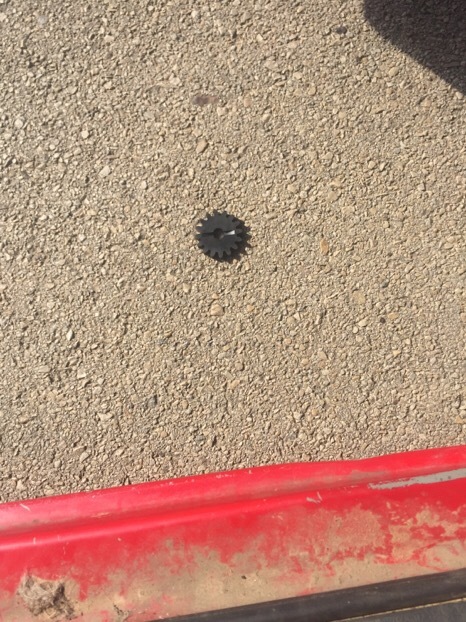 When we took off the plastic lug caps holding center cap on all 8 lug nuts came off with them. 4000 miles since new tires were installed. I caught it before the aluminum rim was trashed. This is why safety wire and cotter keys were invented. You can tighten stuff 'til it bleeds, sometimes fasteners stay tight, sometimes they don't. Was any grease at all on your hubcap threads? Perfectly clean and dry threads might hold, but greasy or oily threads could cause a loss. I lost the rt rear cap on my T wheels but found it in the neighborhood. Yeah, things do fall off. -I lost an oil breather cap that way. -Fortunately, this stuff is easily replaced out of a catalog... unless we're talking original equipment, in which case that's a real shame. -But then again, a catalog repro is better than nothing, I guess. I find it necessary to use a hubcap wrench. They don't come off, although one did come off my '13 touring many years ago. I heard it come off, and searched for a half hour, and never did find it. What really pissed me off was it was a real '13 hubcap too! I've got a route I drive to test things after I work on them. There's a straightaway then a good hill to down, up then a big area to turn around go back. I added oil one day and left on my route and my John Deere cap blew off my head going down the hill. My cousin lives down there so I stopped in for 30 minutes or so and figured I'd get my cap on the way back, it's only a county road. I couldn't find my cap plus I noticed my oil cap was also missing. Glad it wasn't an original 14 cap. I searched and searched and never found either one. I did recover my speedometer gear I forgot to pin on it's test run. I found a neat trick with my 1909 Stoddard Dayton. This car had large ornate brass hubcaps and the threads were not exactly tight. I did not want to lose one so I came up with this easy neat trick. I cleaned the threads on the hub and cap really well. I then applied a bead of pressurized gasket sealer around the hub threads. Then screwed the cap on as tight as possible. Let it set and wella, hub cap sealed in place. When needed I used the cap wrench and easily removed it, after service, cleaned the old sealer off reapplied new sealer and reinstalled the hub cap. I never have lost a hub cap using this sealer method. This happened to some friends of mine almost fifty years ago. A good friend in a general antique car club had a Reo truck from the '20s. Since I had a '29 Reo at the time, we palled around a bit. I was just a kid in those days, and he was a fairly young 40ish. Well, there was this other kid in his area that liked antique cars, and was a bit younger than I was. He used to hang around with several club members, all who accepted him and mentored him. So he got to know the cars in the group fairly well. He often helped work on them and so forth. Well this Reo truck had a very rare its original air cleaner on it. It kind of bolted and clamped into place, rather loosely hanging onto the carburetor. One day the fellow drove his Reo all over town, running errands, picking up things he needed here there and everywhere. He drove home, put a few things away, and opened the hood for a routine check and to his horror, that beautiful and irreplaceable air cleaner was GONE! He was just sick about it, with no idea of where to even begin to look for it. When about ten minutes later, up rides this other kid on his bicycle, air cleaner in hand. He had ridden his bicycle over to a store to get something for his mom and spotted the air cleaner sitting in the gutter on the approach to a freeway overpass. He recognized it, grabbed it and headed right over to the Reo owner's home. The Reo owner is long gone now. The kid? He is still active in the antique car hobby. He and I enjoy meeting up and talking at various meets. We still laugh about that silly air cleaner. I do something similar to brasscarguy, but I use 3m weather strip adhesive, also known as "gorilla snot" Anything that is prone to loosening from vibration gets some snot on the threads. It will keep them from coming loose, but is not too hard to loosen and take off when the need arises. Certainly not like thread lock, and it isn't too hard to clean out of the threads either. Strange things do happen, and parts fall off. On my touring, I always made a habit of checking the big brass knob/nuts that hold the top irons to the car. I just always check them as I walk by the car, and they are always tight. I had owned this car about 12 years, driven thousands of miles and over some very rough roads, and they always stayed tight. Then one day on a tour on a smooth paved road, I heard something hit my running board. The nut fell off! Fortunately someone behind me saw it and picked it up and we tightened it back on with a wrench. The next day my wife and I drove the touring to breakfast, and I again heard something hit the running board. It was gone again, and this time we didn't find it. A couple of wraps of teflon plumbers thread sealing tape, the small roll for a couple of bucks at any hardware wrapped around the hub threads will lock the cap in place. You have to wrap it in the direction the hub cap spins so it doesn't unwind and not use much and yes I have done it. In the future you can remove the hubcap and unwind the the material unlike "poop in a tube" that goes everywhere. Thread sealing tape is minimal and only goes into the groves unlike tube glue. You can pick the end out of the tape and pull it off unlike a mess of tube sealant that just squishes everywhere. Caulk is for windows and doors where you want it to fill up an opening, sealing tape is for fittings like gas lines or in this case a hubcap on a hub. In the 15 years I�ve owned my T this is the only time this has ever happened. When ever I do bearings maintenance I have to use my cap wrench to loosen the hub caps just so I can turn them off. While I agree that it�s not impossible for a cap to loosen on its own I�m 99% sure that this time it had help. The next time I host another big get together at my house I�m going to put the vintage iron in the backyard in between a couple of large fire and nests! I knew those stinging little beasts would come in handy someday. Loctite adheres the hubcap to the hub threads requiring too much pressure to break it loose possibly damaging the hub cap itself. I prefer an easier approach such as I offered a few posts above. The gasket sealer will lock to hub cap to the hub threads but it will allow the cap to be removed with slight effort and not damaging the hub cap. BCG is quite right on this. I would not recommend Loctite on hubcaps (especially brass) or many other soft items that can shake loose. I have used a dab of Formagasket number 2 (non hardening) on things a few times myself. Just enough to keep them from vibrating loose. Loctite might work okay, or not. Something like a hubcap could be tight enough in the threads for Loctite to seize it on hard enough that even a hubcap wrench may not be able to remove it cold. Grease and paint won't like the nearly 400 degree torch job. I like the teflon tape idea. There are some things it wouldn't work for but sounds great for hubs. I can also see where a non-adhesive sealer would work. Thanks for some great ideas. On aircraft, every vital fastener either has a self-locking nut, castle nut with cotter key or safety wire (drilled heads.) You don't want things rattling loose and falling off planes either and not just because the missing parts can be hard to find....Grin! You're making this way to complicated. We are not talking about slathering up the hub and the hubcap with Loctite. I have done this since 1988 when I lost an NOS hubcap. A couple of drops of Blue Loctite is all you need. I have never damaged a hubcap while removing one. Just keep pressure on the wrench which you would do anyhow. You don't even need to clean the threads to put it back on. Just a couple drops will do it again. If you're afraid that Loctite might be too aggressive, try a couple of dabs of toothpaste on the threads.